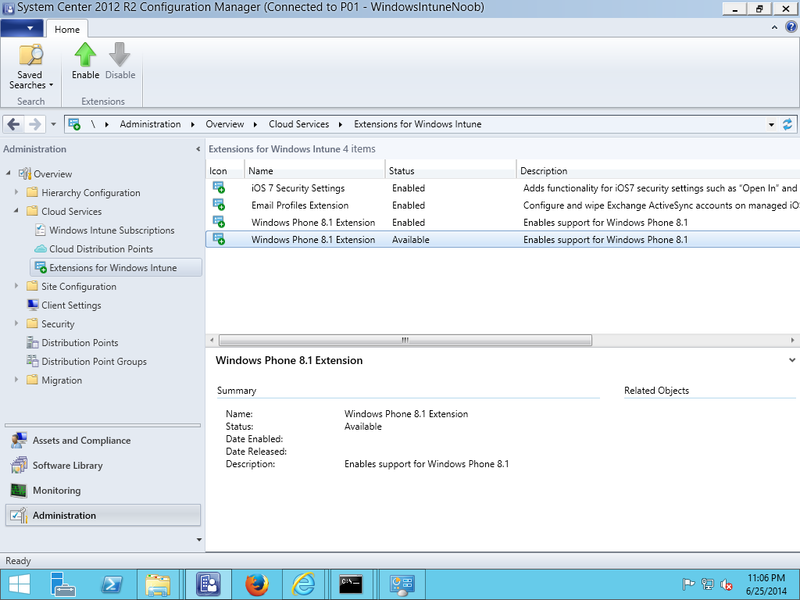 Why do I see duplicate Windows 8.1 Phone extensions in System Center 2012 R2 Configuration Manager ? | just another windows noob ? Why do I see duplicate Windows 8.1 Phone extensions in System Center 2012 R2 Configuration Manager ? If you’ve followed my guide here then you’ll be already familiar with Windows Intune extensions in System Center 2012 R2 Configuration Manager and how they extend capabilities within the product. You may have also noticed in the last few days that another new extension for Windows Phone 8.1 was released, so much so that it appears to be a duplicate. You will only notice this if you have already enabled the original extension. Well the problem is that the duplicate and the original extension don’t contain any information about when they were released and they also lack a ‘more info’ link, those problems in conjunction with the appearance of the duplicate are effectively a bug (or set of bugs) which are being fixed as we speak by Microsoft. I’ll update this post with information about the bugs fix once I hear about it. Don’t panic, you are not seeing things, if you see a second extension matching the name of the first, the explanation is that it contains bug fixes for the first extension and you will only see the duplicate if you have enabled the first before the second one became available. I’ve enabled the duplicate in my environment and after enabling it, there was only one shown in the console. This entry was posted in Windows Phone 8. Bookmark the permalink.